Deril is the eldest of three siblings. Originally from Uganda, Deril currently lives in Lenana slum with his mother and two brothers. The family was victim of the political clashes in 2008. Their home and business was burned. The family was rescued by HHFL from a refugee camp. Deril is not HIV positive, but both his grandmother, mother and youngest brother are. HHFL helped the family relocate to Lenana slum from Kibera slum. The Lenana community was very supportive and welcoming to this Muslim family. Deril’s father died of AIDS in 2007. Deril takes very good care of his two brothers who are also at HHFL. He is particularly close to his youngest brother, Nasur. 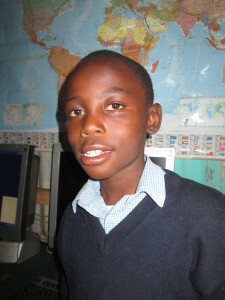 Deril is a bright kid who does well at school. He excels at art and is good in math. He loves sports. He is very athletic and makes friends easily.